SkyiStar Town : Living in the Stars!! 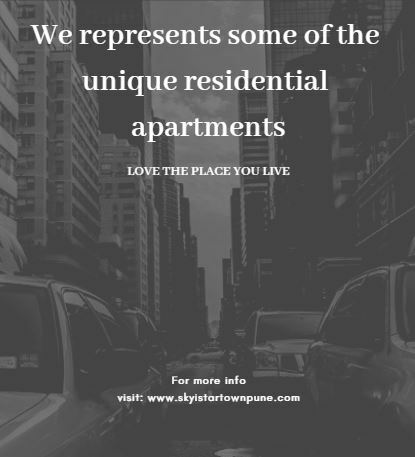 The Skyi Developers feels gratified in introducing to you its opulent residential creation known as SkyiStar Town, coming up on Paud Road in Pune. It is an exquisitely planned township project that is defined by a unique architectural design and comprises of thoughtfully planned homes that allow zero space wastage. There is a lavish club house that lets you enjoy a relaxed and carefree living experience amidst world-class amenities. It is an eco-friendly project that promotes green living. For all its innovative features and exclusive designing, it has been awarded with a CRISIL 5-star rating. Sprawling across massive land area, Skyi Star Town Pune incorporates skillfully designed 1,2 & 3 BHK residences. ensure the health and well-being of its dwellers, the homes feature green balconies so that you breathe-in clean air and keep your lungs healthy. There will be 4 independent wings in every phase and each wing will have only 4 apartments per floor. The well-placed doors and windows allow maximum sunlight to illuminate the corners of the house and minimize the usage of artificial lights. The safe and secure urban township project includes amenities like an indoor movie projector, party lawn gymnasium, plenty of parks &play areas, meditation zone, senior citizen corner, and an uber-luxurious club house. It will be a home to approximately 40 plus bird species and the developer plans to plant over 400 local trees everywhere around the campus. An urban farm, beautifully maintained landscaped greens enhance the beauty of the property. To satisfy your retail cravings there is a town centre that comprises of high-brand retail shops, café, salon, boutiques, medical shops, department stores and lots more. 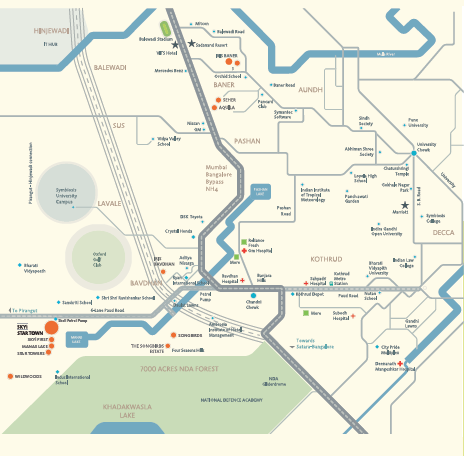 The lavish venture is conveniently located on Paud Road, Pune and is 10 minutes’ straight drive from Chandni Chowk. 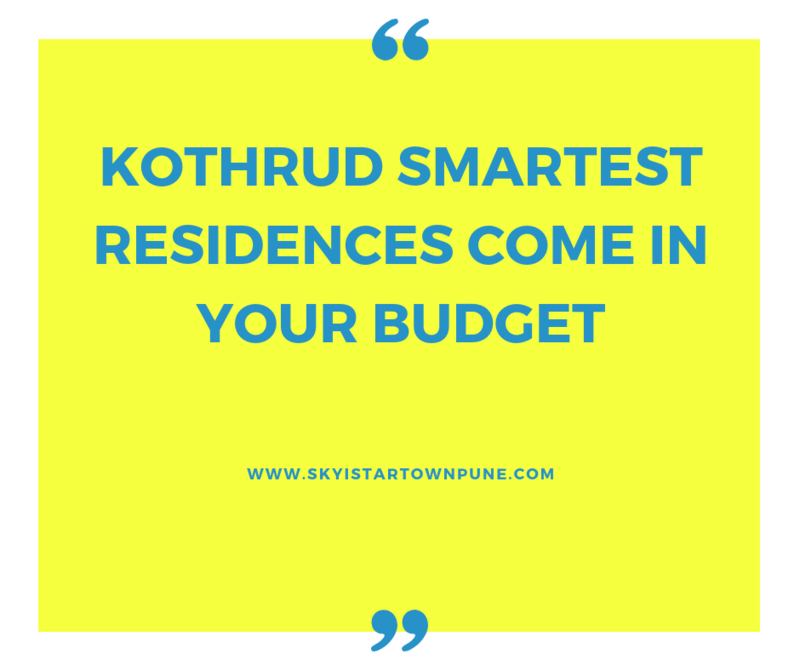 It is very close to Kothrud Next and is maximum 15 minutes’ to the metro station. It is at a brief driving distance from the proposed Ring Road and has many reputed schools lying in close vicinity. The SkyiStar Town price starts from 26 lakh and goes upto 48 lakh. Hence, easily accessible and well-connected, the upcoming property Skyi Star Town Paud Road is a perfect manifestation of grandeur &majesty and lets you enjoy umpteen moments of joy & pleasure. It takes you to next levels of luxury and makes life here a truly wonderful experience. It is sure to fetch you excellent returns in the years to come. Book your Dream Property in Pune now! 5 Mins from Proposed Pune ring Road. 10 Mins from Mumbai Bangalore Highway. 10 Mins from Chandani Chowk , Paud Road.